It’s that time of the year when we should be saying goodbye to the cold and damp weather of Winter, and are looking forward to the warm and the dry of Spring into Summer. 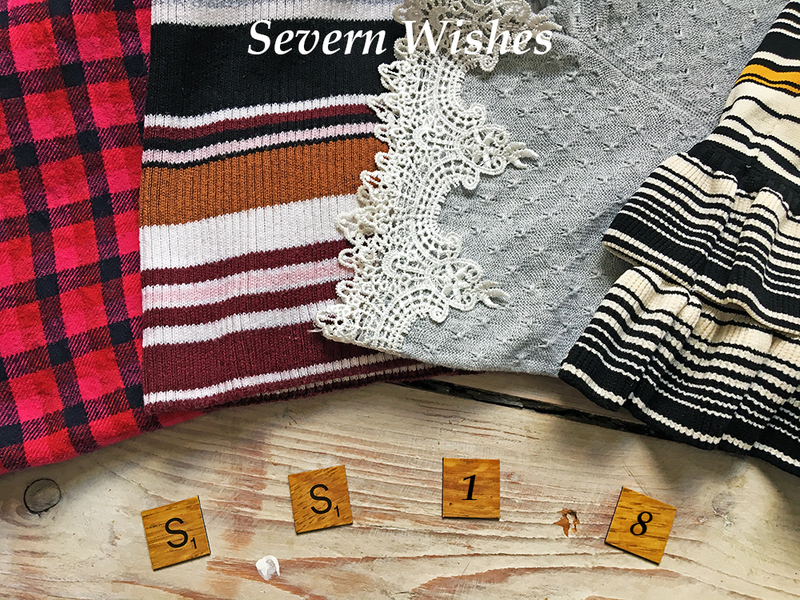 In this post today I am talking about making those Winter to Spring fashion transitions for 2018. What I am wearing and some latest purchases too. So what can we expect for the transition this year. There are many things that are still in this season, one of which is Lace, another Embroidery and the other one is Stripes. 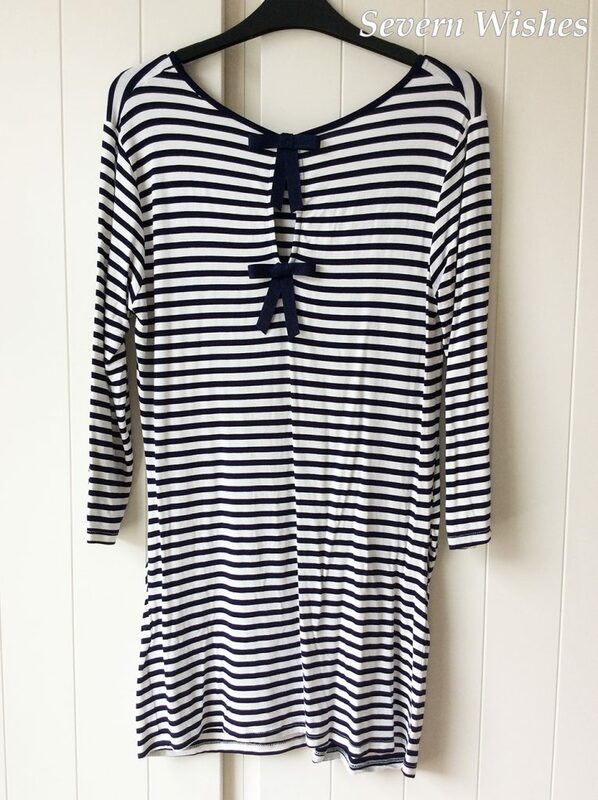 Nautical and Striped themed clothing is well and truly in still this year, with several brands mixing the stripes with a variety of other fashion trends such as Bardot and Cold Shoulder. I have noticed a great deal of striped trousers, both work wear and casual that look very sophisticated and can be paired with shirts, blouses or a nice top. 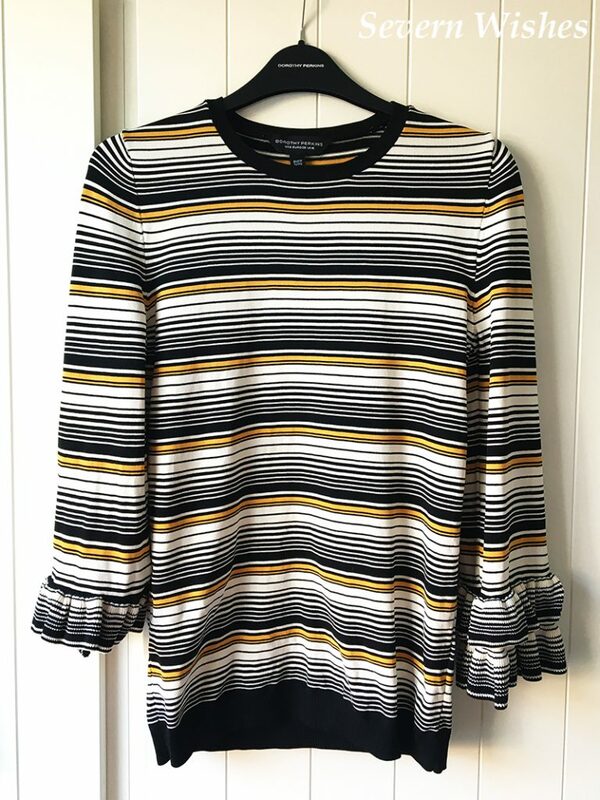 It’s good to mix your trends, but shapes are often hard to match, a plain bright top can really work with some striped trousers and high heels. Another style making a comeback is Polka Dots! 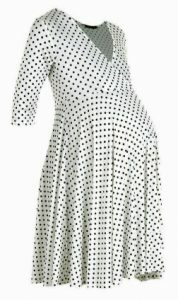 These spots can range in the tiny to the huge with lots of companies choosing to put them on everything from tops to dresses and I have even seen trousers! Something else I have seen these past few weeks was Bold Colours. 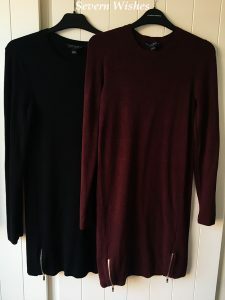 Bold Reds and Blues seem to be all over the markets and the LBD (Little Black Dress) seems to have been reinvented by some, making it more of a statement piece that is no longer just a black dress anymore. 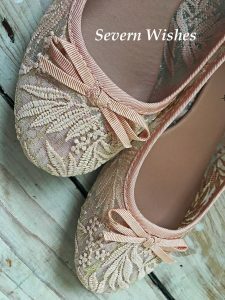 It often now has lace, embroidery, varying hem lengths or even unusual material combinations! 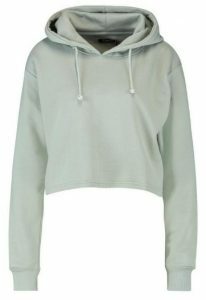 Saying all that though Pastels are also in for Summer, so be prepared to see a lot of Pink, Yellow and Turquoise shades in the high street. Finally, and a style that I love all year around is Floral! 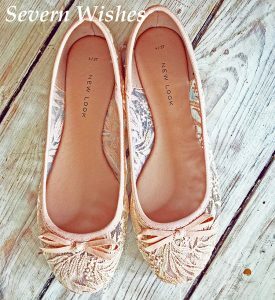 Floral’s are still in, and contrary to what most people think they are not just for Spring and Summer! 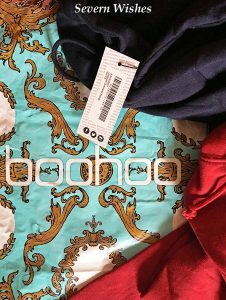 I have seen work wear, dresses and tops in the “new in” sections on various websites. There are so many trends that have major floral inspirations for 2018. 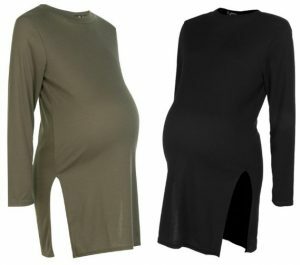 I wanted some new maternity tops for the Spring to Summer transition of my pregnancy. It’s always nice to have a couple of things that are new, but I also wanted items that I could still wear after my baby is born as well. Because I am due in July I will still have many weeks of the Summer left to hopefully enjoy my new purchases. 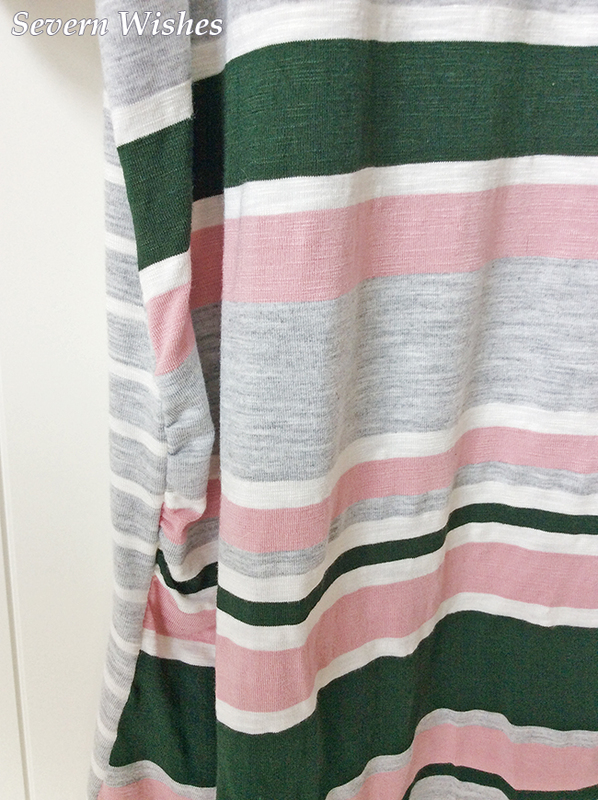 I really love the look of this top but after two wears and washes the material began to bobble and look quite old. 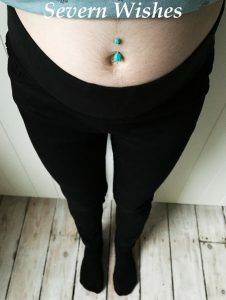 It is a real shame because it fits my bump perfectly. I just wear it around the home now and not out as I had originally done so. 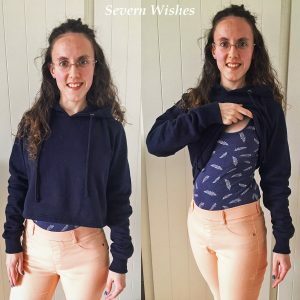 I really like the colours of this top, it was flattering for my shape including my shoulders and my bump because of the curved neckline. It washed well and I feel I will get a lot of use out of it. 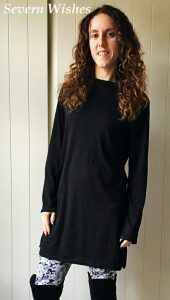 It’s easy to pair with both my maternity leggings or maternity jeans. 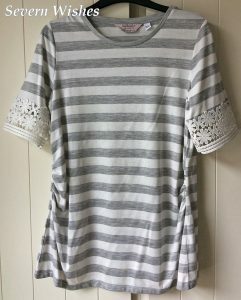 I really like this top, it was flattering for my bump and it looked nicer than just another striped tee because of the pretty floral details on the sleeves. So far it has washed and worn well but it’s only been worn twice. 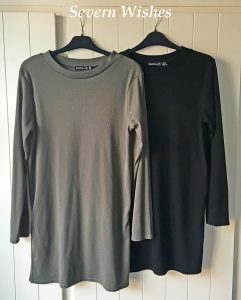 This top was a little bigger than the others I had chosen, it was therefore less flattering, but on a warm day I would feel more comfortable wearing this one rather than a fully fitted tee. The bows are a nice addition to the back of the top. 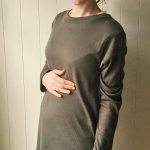 Thank you for reading this fashion and maternity related post today. 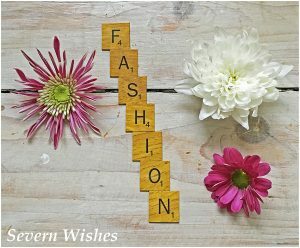 I have been reading up on the recent Fashion Weeks and I can safely say there are some trends that have been used the past few years that are coming around once again. This is great if you purchased things of this type last year! 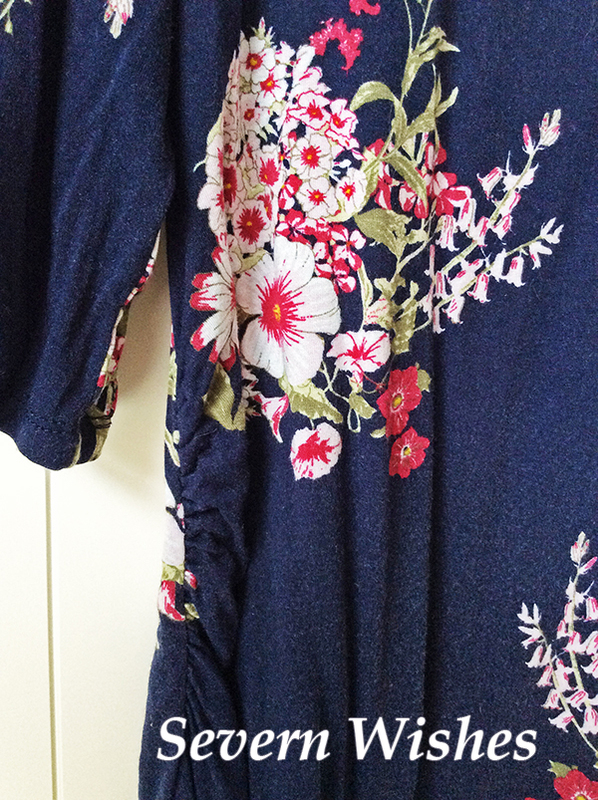 Some of them never get old, you always see Florals, and usually see some Lace in the summer. But a couple of summers ago everywhere you looked were Stripes and Nautical themes, well guess what they are returning – and I’m so glad! 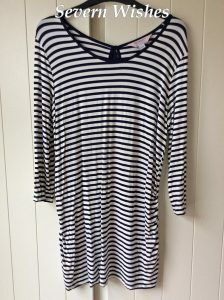 Here is a dress that I bought last year from Dorothy Perkins, now that Stripes are back in I feel great wearing something that is on trend. Plus I could still fit my bump into it too – huge bonus! I paired the dress with flats and a long necklace. A nice plain jacket won’t distract from the stripes theme. Florals seem to be huge again this year, and not just small amounts on other sorts of designs, they dominate some pieces completely. I have seen dresses and tops that are covered in floral patterns, you cannot go wrong with flowers in my opinion. 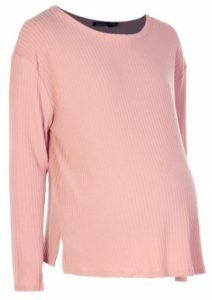 Here I am last week in a Maternity Top from Dorothy Perkins. 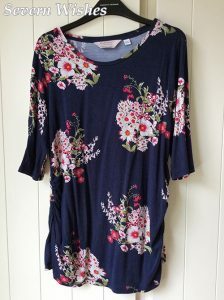 This pretty navy tee has pink floral details and is very flattering for me with bump. 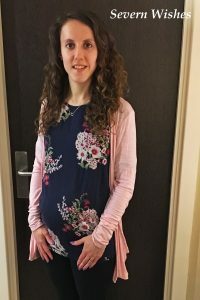 I paired it with my maternity leggings from George at Asda and a Pink Boyfriend Cardigan from New Look to help bring out the colours in the flowers. There are Spots and Polka Dots in a variety of trends this SS18 as well, and the dots all seem to vary in size. 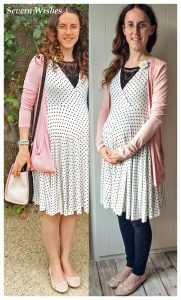 I have already picked up two items that I will wear later in my pregnancy with a theme similar to polka dots, one is dots and the other looks as such until you get closer and realise they are tiny hearts – so cute! Checks were also back in, especially over at London Fashion Week, as were Wide Leg Trousers, Pastel Shades and Ruffles and Frills seem to be making a come back too. If you’re lucky enough to be going on holiday this summer you’ll see lots of swimwear with pastel colours and ruffles I have no doubt! Another trend I have seen is Embroidery, this was huge last summer, appearing on jeans, shirts and even boot! 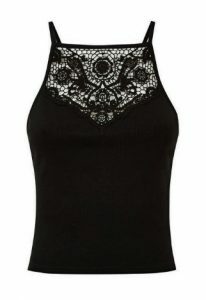 It looks like it’s back again with even more intricate designs in some high street chains. 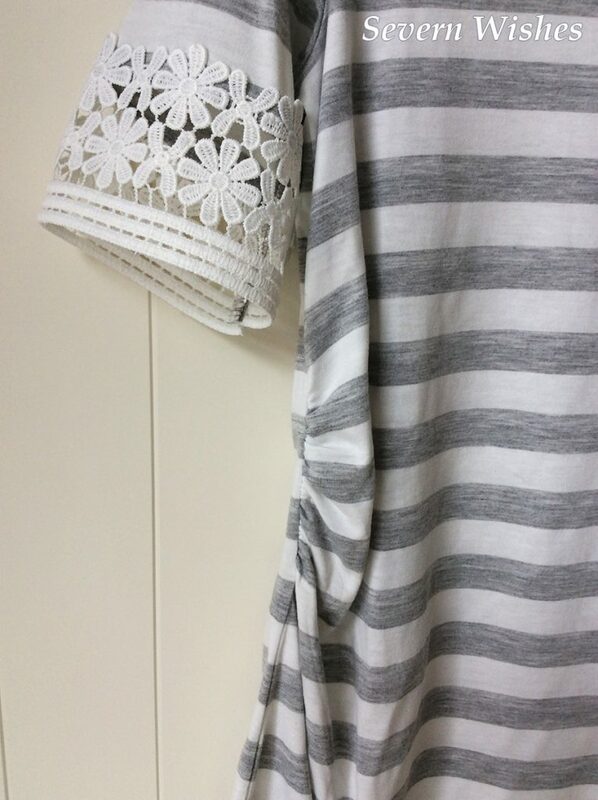 I bought T-shirts and Jumpers with various Embroidery styles. And I also created my own shorts with patches on! I’m glad I invested in a couple of items last year, though I’m not sure how much longer they will still fit me. I will be searching for bargain buys in Maternity sections over the internet in the coming weeks. I will review those items in a separate post though so that this one isn’t too long. Thank you for joining me for this fashion blog post today. If you’ve come across any awesome bargains let me know in the comments. 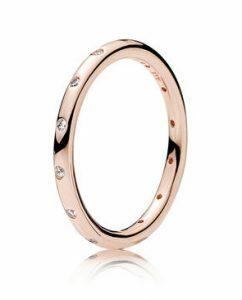 Everyone knows that Rose Gold is on trend again this AW17 season. 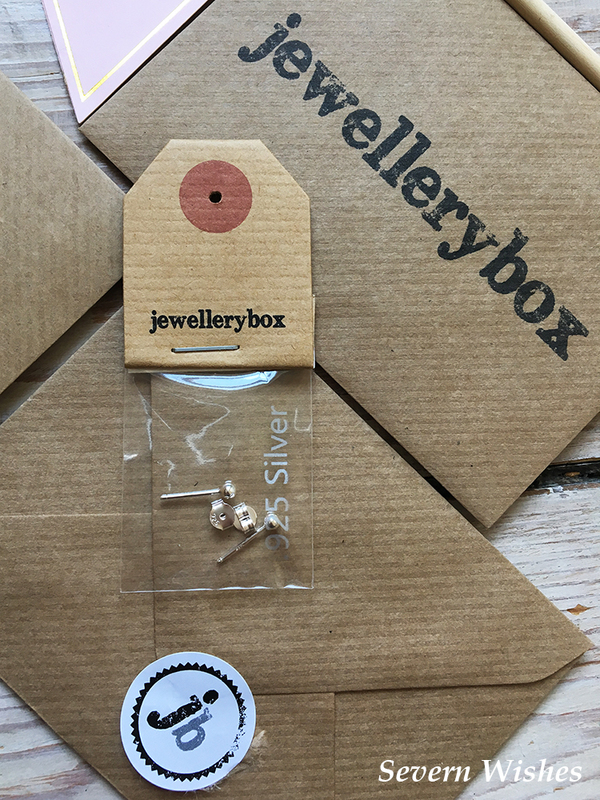 In this short blog post today I’m going to be telling you about two ways that you can wear this gorgeous shade of metal. 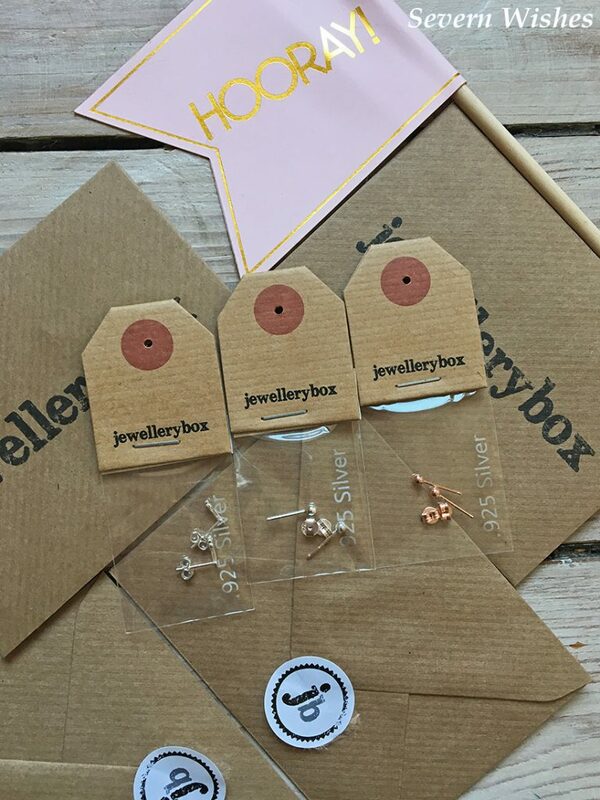 You have the freedom to choose your jewellery and wear it whichever way you want to, so that you can have your own fashion. I cannot stand it when brands tell people “you must wear it like this to be on trend”, well no you don’t, style your own fashion people, wear things just how you want to… take inspiration of course, but do as you like and what suits you. I know I do! 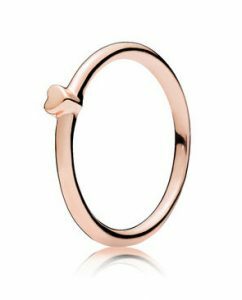 Now Rose Gold is available in so many statement pieces this year, so it’s always good to invest in something well made. That is if you can afford it and if you like this colour of metal of course. 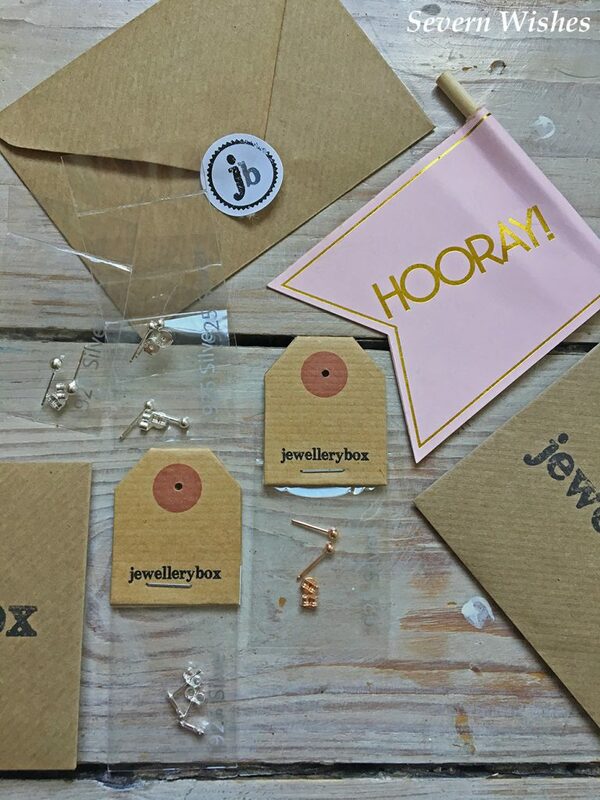 There is one particular Trend that I love because of its endless versatility, and that is the “Mixed Metals Jewellery Trend“. 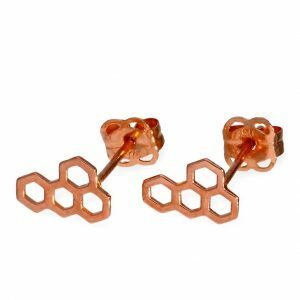 The other one is what I would call the “Delicate’s Jewellery Trend” which surrounds one individual type of jewellery and keeps that as the focus point. The “Delicate’s Jewellery Trend” simply means you focus on one part of your body to wear the jewellery. 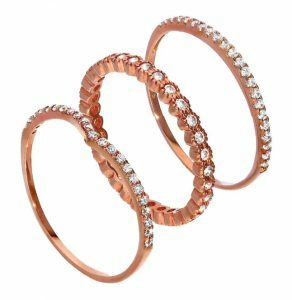 So if you’ve got a big chunky knit on this winter nobody is going to see your neck or your wrists, so you cover your hands with pretty Rose Gold rings and jewels. If you’re wearing a long sleeve dress for example you would focus on statement earrings to catch peoples eye. By choosing one part of your body it’s all about complimenting the outfit that you’re wearing and showing off your best bits. 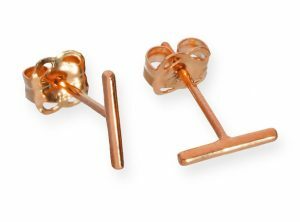 The Mixed Metals Trend is pretty simple, you take two or more metals and mix them on a part of your body. The easiest way to achieve this look would be rings on your fingers. 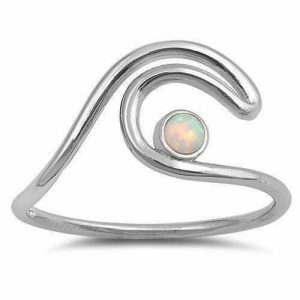 You could wear Yellow Gold, Sterling Silver, Rose Gold, Platinum, anything! So long as you mix them between the hands. 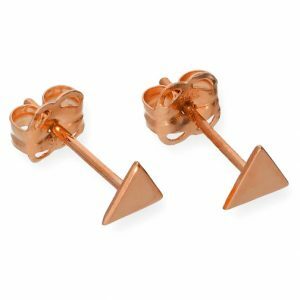 Another cool way to use this trend would be earrings, especially if you have a graduated lobe like I do. Using different coloured studs to create this look. 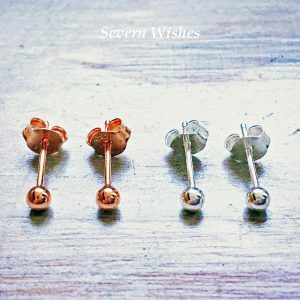 (Here are my own studs, they are from Jewellery Box UK). 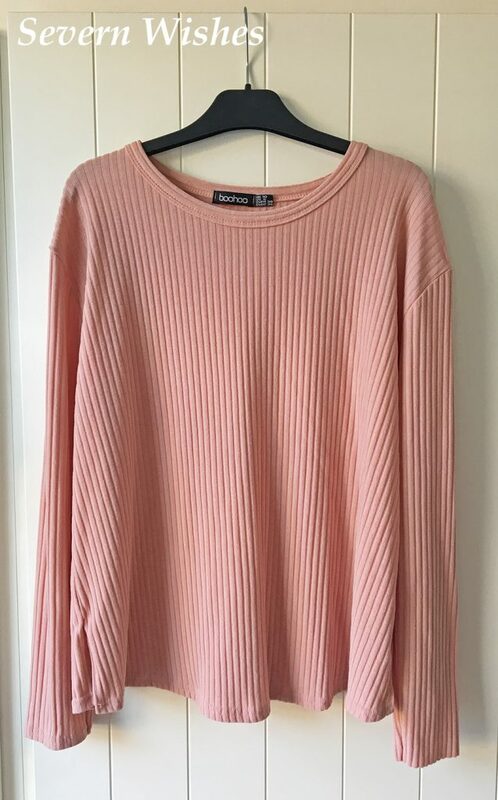 I actually saw the character of “Betty” played by the beautiful actress Lili Reinhart, wearing this trend on one of the new episodes of Riverdale. Keep a look out if you watch it, she wore two silver studs and one gold in either ear and it looks amazing! (As is the show by the way if you have Netflix check out Season 1). Another way to wear the Mixed Metals would be several metal bracelets, these would be harder to match up though so they look like they go together. 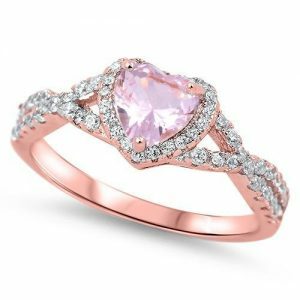 These two rings have really caught my eye from the company Cherry Diva. 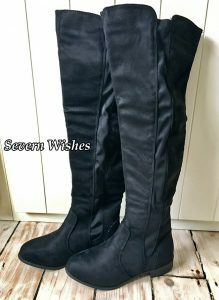 You can see reviews of other Cherry Diva items that I have bought by clicking the category on my front page. Check these items out further by clicking my links. 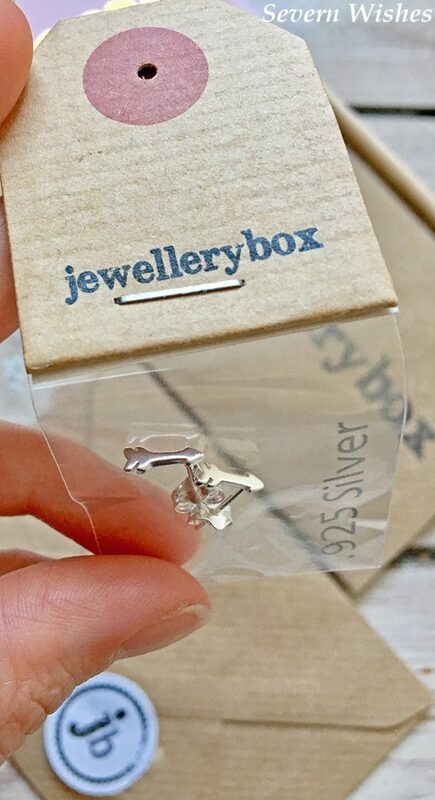 The following items are from Jewellery Box UK, while browsing on a recent order I saw all of these beautiful things and hoped one day they might be additions in my collection. I don’t have very much Rose Gold. 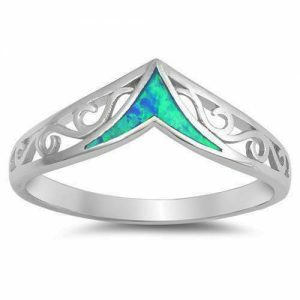 Check out my Reviews on my main page by clicking the Jewellery category. 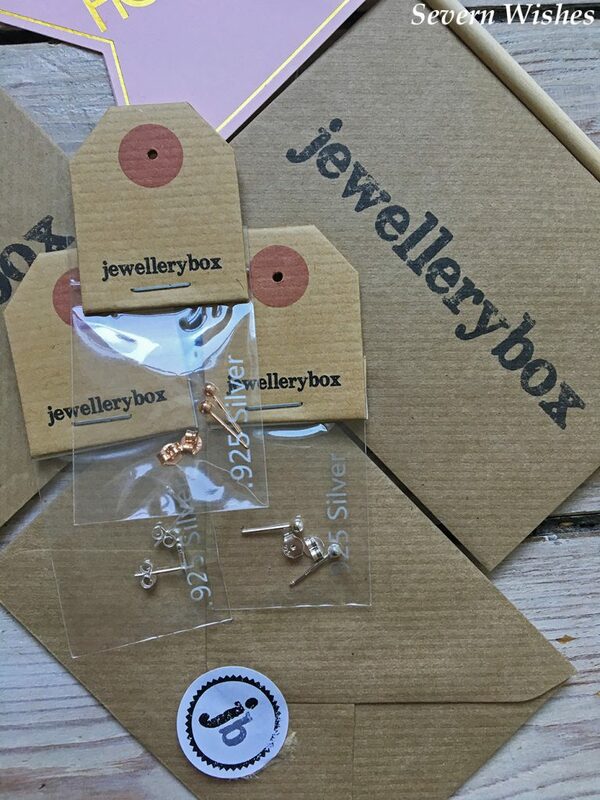 Click the pictures to go to the Jewellery Box UK site. It is probably a little sad, but I don’t own anything from Pandora. 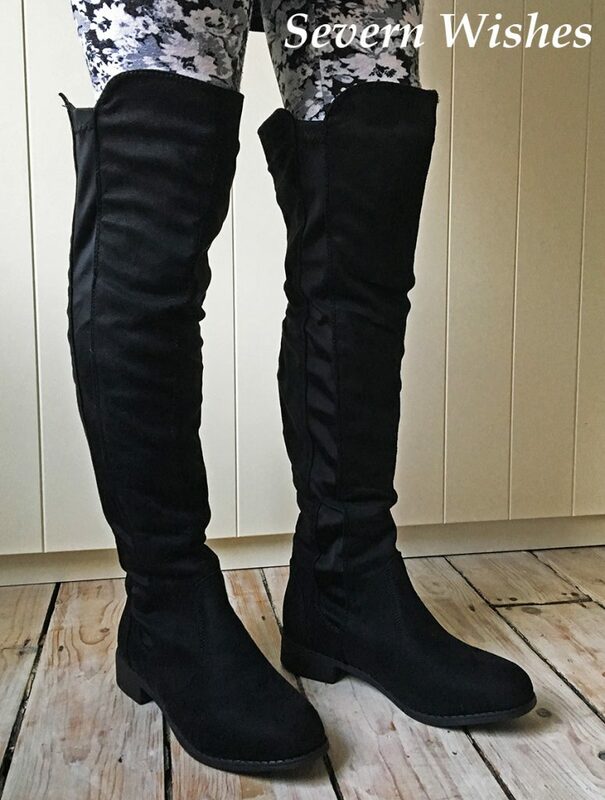 I do get their newsletter and follow on social media though, and I saw these advertised and thought they were so stunning. You’ve got to dream haven’t you! Click the images of them to go to the website. 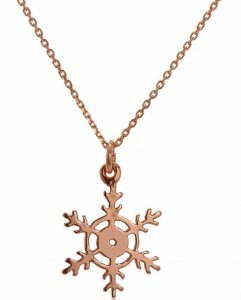 So there we have it everyone, my current Rose Gold Jewellery wishlist, you never know I might be able to treat myself in the new year! 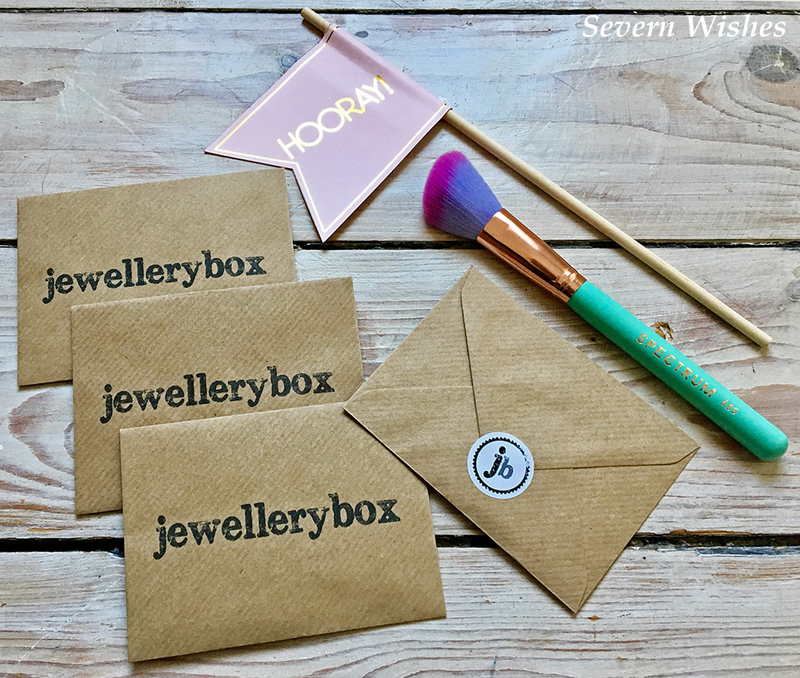 Thank you for reading this blog post today, I hope you’ve enjoyed it, and perhaps got some gift inspiration for someone too! Review of Black Military Coat from Wallis. 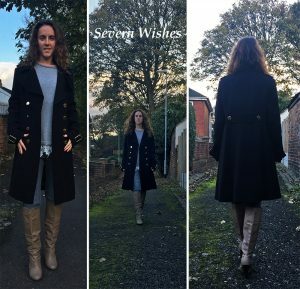 My Review of the Black Military Coat from Wallis Fashion. 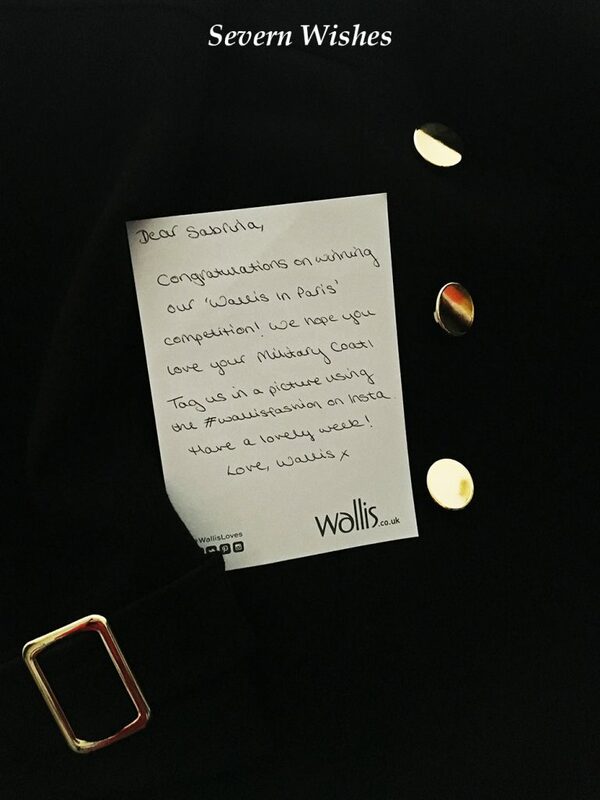 I’m ecstatic with my coat from @wallisfashion that I won in their “Wallis In Paris” competition last week on Instagram. It was a wonderful surprise to win! And I immediately offered to review the coat for them. Finding myself really loving the Autumn Military trends this year, and this coat is just perfect. 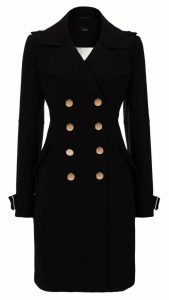 With it’s fancy golden buttons for some contrast against the thick black fabric, this coat isn’t just beautiful it’s also very well made. There are two fairly deep pockets on either side and eight buttons on the front. It has a lining on the inside to keep you warm on cooler days. 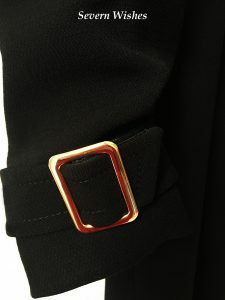 There are two buckles – one on either sleeve that add a nice three dimensional and shiny aspect to that part of the coat. The military style also has two button studs a top of shoulders, and it features two button studs at the back too. For this review I have paired the coat with my Eden Skinny Jeans as you’ll see in this photograph, and a brand new jumper from Dorothy Perkins too. However this coat is so versatile you could pair it with a variety of Denim or a Skirt, long boots would look great. It would also like nice with a beautiful dress for an evening. An Excellent Autumn to Winter Transition Coat. This coat is made from a heavy black material, it is made from 64% Polyester with 33% Viscose and 1% Elastane. The inner lining is 100% Polyester and is rather shiny. It has many nice features such as the gold Buttons and Buckles. 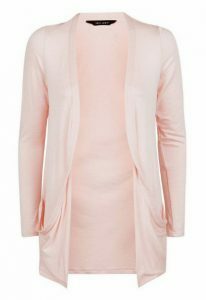 A coat that is rather flattering when worn, because it’s fitted it works well with whatever curves you might have. I’m the top end of Petite but this coat still came to my knees, which is just how I like long coats to be. I loved that it was long enough to keep me warm and the arms were also long too, mind ended at the base of my thumbs. The 8 front buttons add glamour and there are several nice features such as the double breasted style and the way the fabric has been cut. 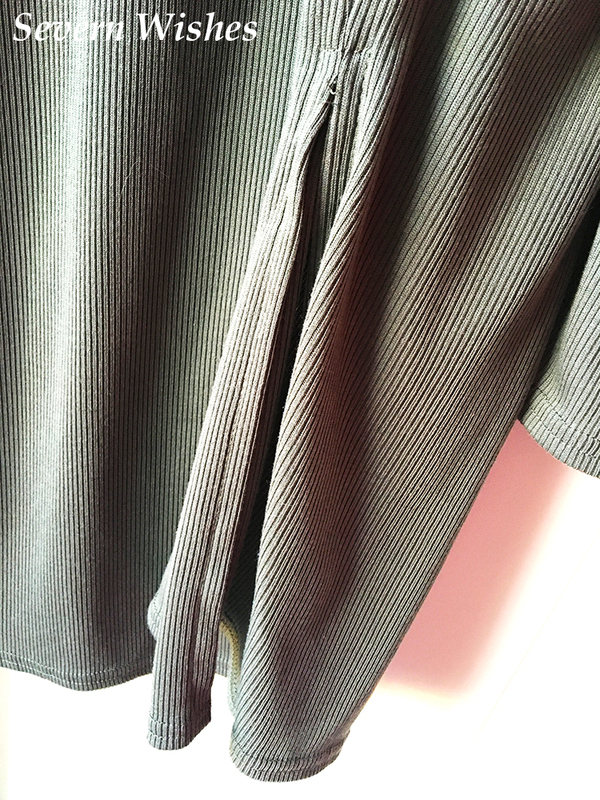 The shape of the front of the coat is really unusual and I liked how it falls when being worn. It’s a great transition coat from Autumn to Winter because it’s easy to layer beneath it. I’m an 8 with jumpers, so I chose a 10 so I could wear a chunky jumper under it. The coat fits perfectly around my shoulders but is quite heavy over all. The Wallis Military Coat seems to be a staple for any wardrobe, and I’m very glad that I now have one. Hopefully I will get many wears and many years of joy from wearing it. In my opinion the one and only downside to the military coat is that it’s Dry Clean Only. A military-inspired coat by Wallis Fashion. I really hope you have enjoyed this review. Thank you again Wallis for picking me to win this incredible item as a prize. Have a wonderful end of October everyone! 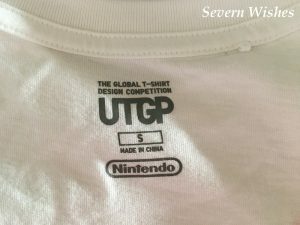 A Uniqlo Store T-Shirt Haul – Featuring Designs from the UTGP 2017 in Association with Nintendo. Luckily on a recent visit to London my husband wanted to go shopping down Oxford Street. He absolutely loves the work shirts available in Uniqlo. So I agreed to go along with him and give him my opinions of course. 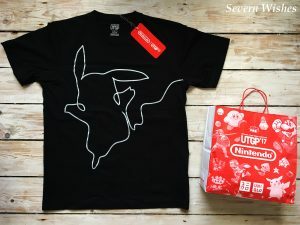 What I didn’t know was that the brand was running a collaboration with Nintendo, where people had designed these awesome T-shirts. Based on Nintendo Video Games and various Characters too, the T-shirts were both for male and female and some were even unisex, at a cost between £11 and £15 each. Of course I browsed and I couldn’t have left London without getting a few of them. (For those who don’t know it I’m a very keen gamer!) So here are the items in question, with the collaboration details and then I will review them for you. My husband bought me this one, he knows I adore Pikachu! This tee brought back so much of my childhood, Mario, DK and hours of fun! I chose this one because of the colours and the googly eyes were fun! 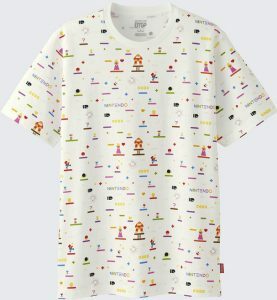 So this T-shirt design contest is held by UNIQLO and people from around the world create and submit original T-Shirt designs based on Nintendo characters. The designs varied with Donkey Kong, Pokemon, Super Mario Brothers, Kirby, Splatoon, Star Fox and of course a Nintendo favourite The Legend of Zelda, all making appearances. All the T-Shirt Characters of course belong to ©Nintendo. 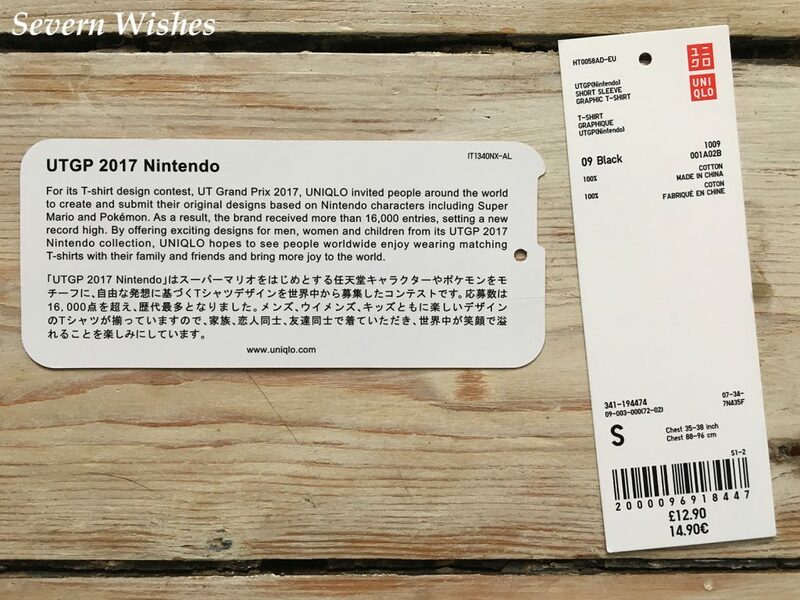 A final 25 entries made it to the process of being made, and have been distributed worldwide, with the Winner being a man from Japan who did a Mario inspired design. For the UT Grand Prix for 2017 and they received more than 16,000 entries, a new record high for the competition. 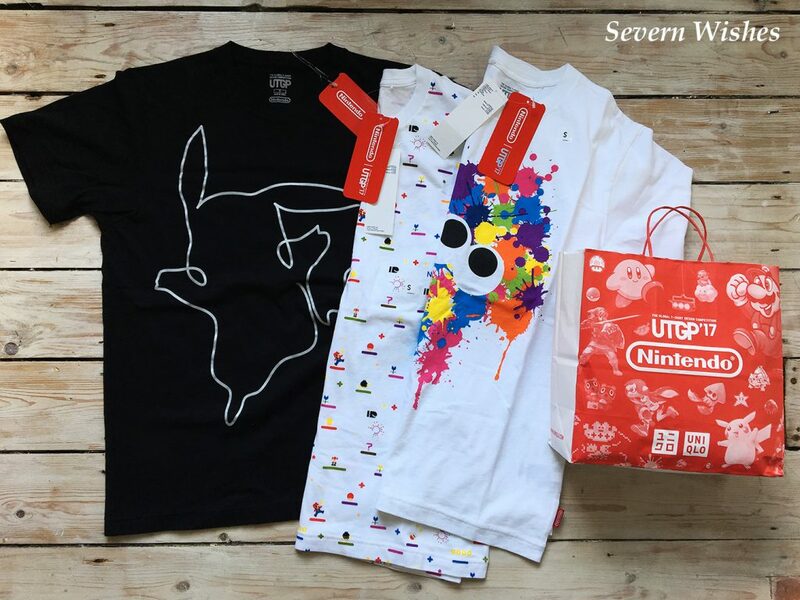 By offering these unique and exciting designs for both men, women and children from its UTGP 2017 Nintendo collection, UNIQLO hopes to bring more joy to the world by giving people the chance to own these one off designs. With the standard being so high this year I cannot wait to see what people come up with for the next one! There are very few of these wonderful T-Shirt Designs left now, because I went a couple of months ago, and sadly I just hadn’t gotten around to reviewing the items. Anything that is still available can be found in the Summer Sales in stores and online you can fin them here on their website. Each tee is 100% Cotton, super soft and the designs are all well made and have consistent good quality. The colours are still good after several washes, and I am really pleased I got more than one. There were a few designs that were already sold out, and I am quite disappointed that I didn’t get to buy them. 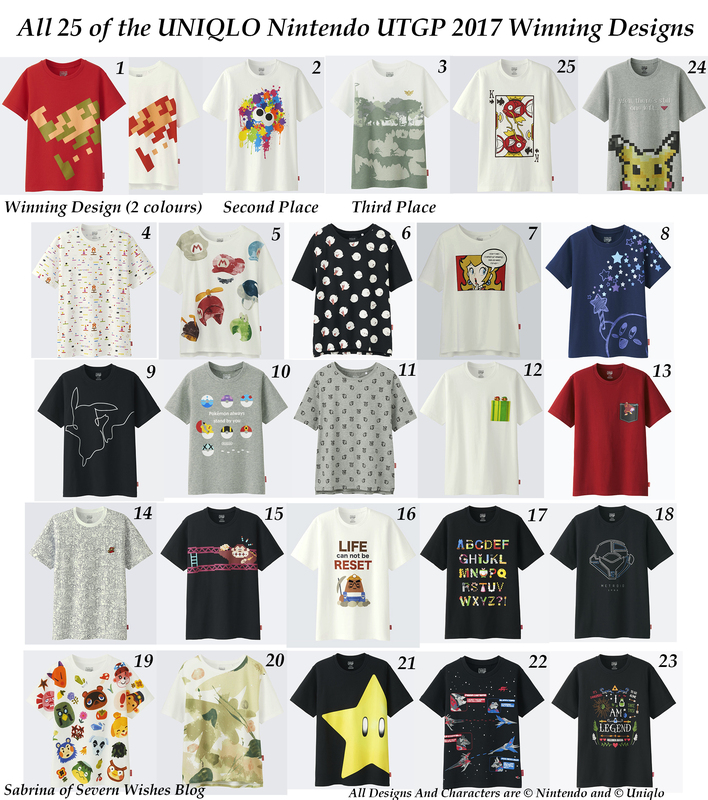 I grew up playing Pokemon on my Gameboy Colour, so I would have adored all of the other Pikachu Tee’s (Numbers 10, 11 and 24 on the list) and I personally think the Mario Star Tee (Number 21) is awesome too! As you can see by the list of pictures I have compiled, the T-shirts are all excellent. I didn’t even see some of these when I went to London in May! Wished I had! 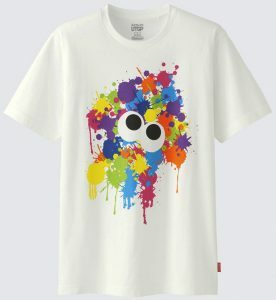 Overall I am happy that my husband wanted to go into Uniqlo that day, otherwise I never would have seen these T-shirts! 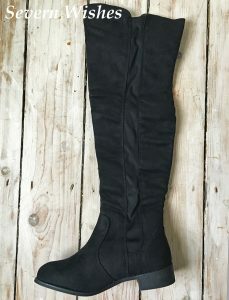 So it’s thanks to my Ed, I now have them in my wardrobe. For me I wear them as casual tee’s, for doing shopping in, gaming in and general wear. 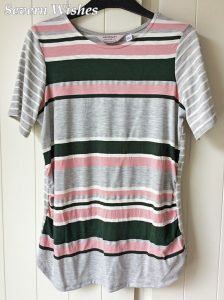 But nevertheless I think they do bring some joy, the comfort and the quirky designs, so I guess Uniqlo have succeeded with their aim, with me anyway. Soft and well made, these tee’s wash and wear well. So far the colours have remained strong and bold. Because it’s cotton it can be washed on a cool cycle helping the environment. 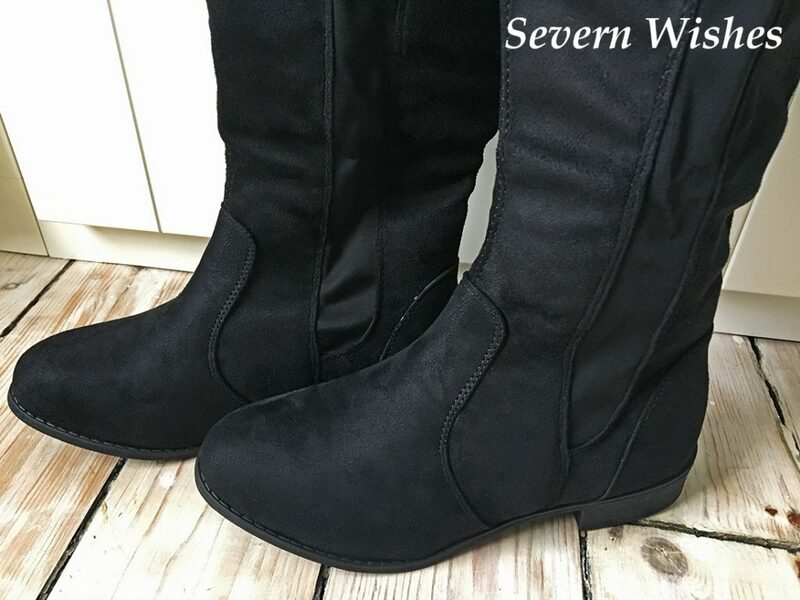 I am a size 6-8 and chose a Small, the sizes fitted well. They are good value for money most definitely. And finally I would like to add that they certainly do look unique. 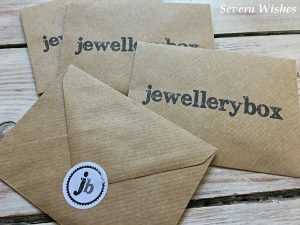 Thank you very much for reading this blog post today, I really hope you’ve enjoyed reading about this contest and the designs for this year. 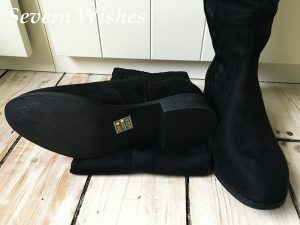 As well as my personal review of the items of course. Until next time, thank you. Oh and I hear that UTGP for 2018 will be a Marvel theme competition!!! :O How awesome is that? !